I am Ashley's wonderful husband, Nate, and I am honored to write a guest post on her blog. Since I'm the baker of the family (she's the cook) I thought it might be fun to write a regular feature on her blog. It might end up changing, but I thought a recipe every Saturday might be fun. I've gotten very accustomed to using a kitchen scale in my baking endeavors, so I will always use mass measurements in the recipe for the main ingredients. For those of you without a kitchen scale, I will also include the volume measurements that they are based on, but note that because I use mass I may have tweaked the recipe slightly from the volume-based recipe. It's easy to do that when you can deal with 2 gram increments. I learned about beer bread from my older brother (if my memory serves me correctly) and have always loved the flavor of it. It's also as easy a bread recipe as you'll ever make that doesn't require a bread maker. For best results, let the bread sit for about 15 minutes after you pull it out of the oven. When you pull it out, there will likely still be boiling, liquid butter at the bottom of the bread pan, but it will get absorbed into the bread slowly. That's what you get by waiting those 15 minutes - your bread will be even more buttery. I originally found this recipe here. *Final Note: I've discovered that lighter, lower-end beers actually make for better beer bread. You can try using darker or higher-end beers, but you'll find that the bread will start to taste less like bread and more like the beer - which is not a good thing in this case. For this particular beer bread, I used Blue Moon's summer Ale, called Honey Moon. 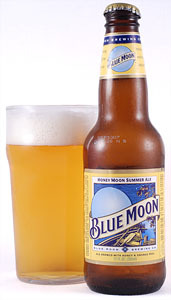 We originally bought it because I typically like Blue Moon, but this one just didn't taste very good to me. Luckily, it still proved useful in my beer bread!